The way it works is there's an application on the phone that checks if a face is detected. Then it communicates with the robot over Bluetooth and tells it to turn left or right, depending on the position of the face in the frame. Here's the application's source code if you want to take a look. I don't have building plans for the robot itself, but any robot with tank-like steering would work. You need something that would consume the video stream and split it into two new separate streams that could be used by two applications. I'm not familiar with Android but it is definitely possible under Linux. Hi, i wanna ask you something. 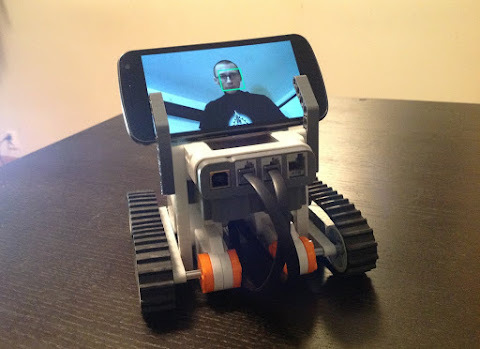 How your phone comunicate with your robot ? I mean i don't see any cables in there. The phone talks to the robot over Bluetooth. Some devices might not support face detection as it's hardware dependent, but I'm not sure if it would crash the app or just not detect any faces. Can you check logcat to see if there's any error message or stack trace? Hello, this is the log. Do you have Bluetooth disabled by any chance? hello sir can I get your email address please? I watch your youtube video about your face tracking robot which looks very good. I wonder our you can send me the app for my android smartphone, I want to try it in combinatoin with arduino. Please can you send me the app, I will be very thankfull.